Now that Apple is talking about AR and VR, should we be too? It’s that time of year again. Yes, it’s WWDC time! We got to see what Apple has to offer for the rest of the year and they didn’t disappoint. This year, they presented a ton of new hardware and upcoming versions of their operating systems to the world during the annual developer conference. Normally the WWDC is a software-only event, but this year was packed with things like new iPads, MacBooks, Macbook Pros, and even an upcoming iMac Pro with a starting price point is $5000! The big shift for me is that the iPad is becoming a more viable laptop replacement. The iPad (all models) will have far better multi-tasking and even a dock bar just like your Mac. They introduced a new Files app that’ll let you browse all of your files – local as well as cloud-stored (Dropbox, Google Drive etc). 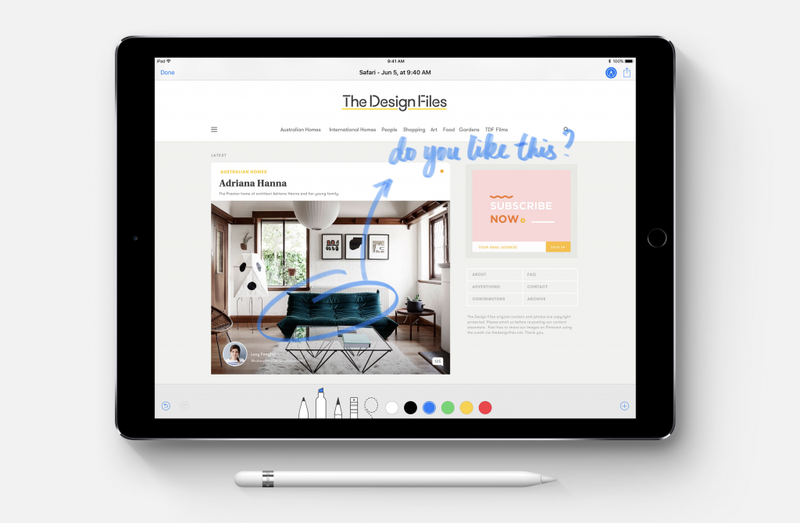 I’m really seeing how the iPad could become a computer replacement for the average computer user since most of what they do is surfing and occasionally creating word document. Not sure if you remember, but I even ventured into this myself when the first iPad Pro came out. I couldn’t quite make the shift back then, but now I’m super excited to maybe give it another go! One of the features I would benefit most from is the ability to markup PDF’s and webpages. A lot of what I do is give feedback to developers on design and functionality. — Perhaps margins are a bit off, the headings too small, or we should add a feature that we’ve already developed, but I’d like to visually communicate with them exactly where I’d like it placed. — If you look at the work I’ve done for Australia’s most famous babe, Frank, it’s mostly marking up their e-commerce solution with conversion improvements. Gaining the option to use a pencil to draw directly on the screen and send it to them as a PDF would have been far easier and more fun! One area that’s being discussed is whether or not Apple would go into is AR (Augmented Reality) and VR (Virtual Reality). Apple has now released developer kits for both of these technologies and showcased them with games on stage. All in all, this segment of the WWDC was a good 30 minutes. Personally, I’ve never understood the hype behind AR and VR. While I can see some of the benefits with AR (e.g. placing digital content on top of the real world), I’m really struggling with finding great use cases for VR (e.g. a totally virtual world). Perhaps I’m getting old, but the VR hype kinda feels like the promises made by 3D content. While the experience is better, the feeling of wearing those dorky glasses kinda outweighs the added experience. But you know what? Just like I wrote in “Become a better UX-Designer with these three words”, it’s totally fine to say: I don’t know. I just don’t know what AR will mean for our industry. I don’t know how it will fit in our everyday lives. I don’t know how VR will affect our social norms and the experiences we have. The fact is I’m excited about AR and VR because I don’t know where it will lead and that’s thrilling. As a designer, I’m looking for things that make sense. Not just beauty for the sake of it, but rather a form that enhances the functionality. An excellent example of this was when I found out that iOS11’s ability to scan documents by using the camera at basically any angle was powered by ARKit. It clicked with me that AR can play a role in what I do. The moral of this story? I’m impatiently waiting to find out how I was wrong to doubt AR and VR.